During the last week of September we participated in the annual Banned Books Week by offering a Blind date with a Banned Book from our regular collection. 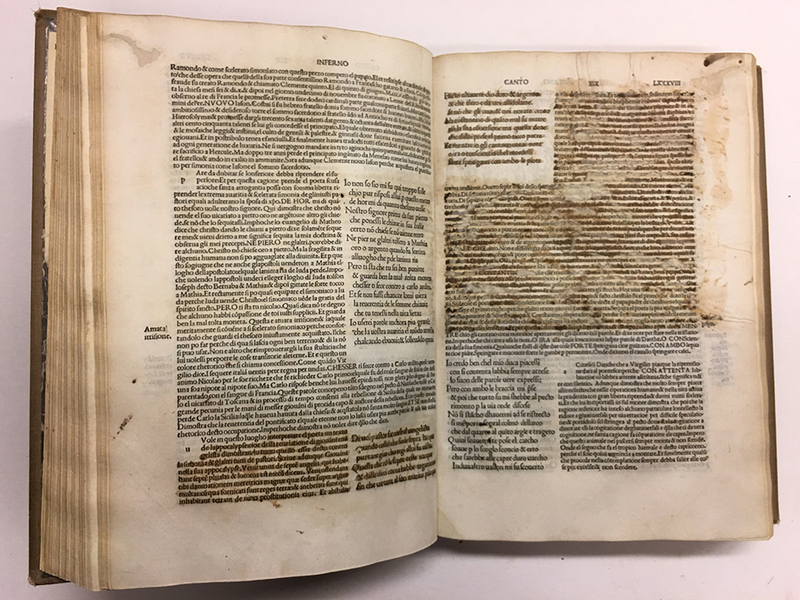 We thought we would take the opportunity to highlight a more historical example of book censorship in our 1497 copy of Dante’s Divine Comedy. 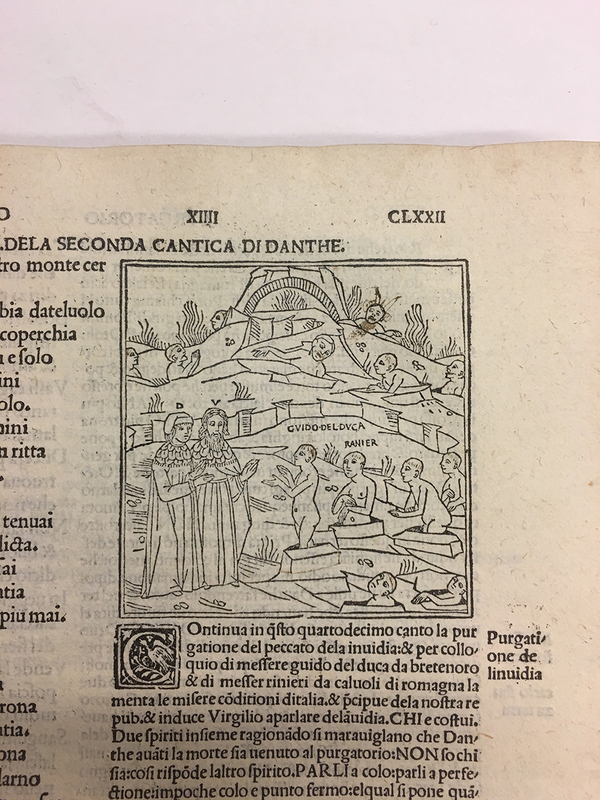 Library Citation information: Dante Alighieri, 1497. Danthe Alighieri fiorentino. Impressa in Venetia: Per Piero de Zuanne di Quarengii da Palazago Bergamasco. Upjohn-Waldie 1497 D36 fol. Full page woodcut from the first Canto in Danthe alighieri fiorentino. Select image to enlarge. Annotations on title page by members of the Expurgation Committee. Select image to enlarge. 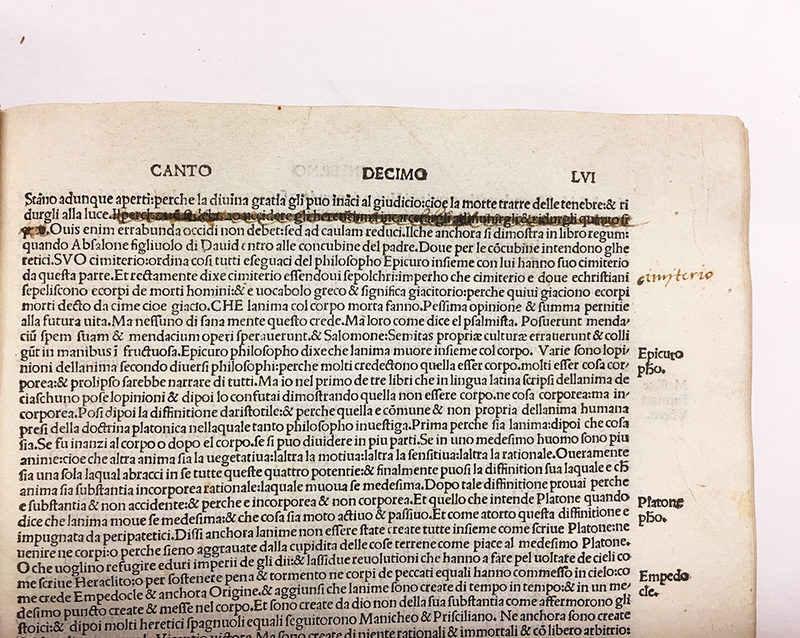 There are a number of post-publication modifications to our copy of Dante’s work that show it was censored by Inquisition committee members. 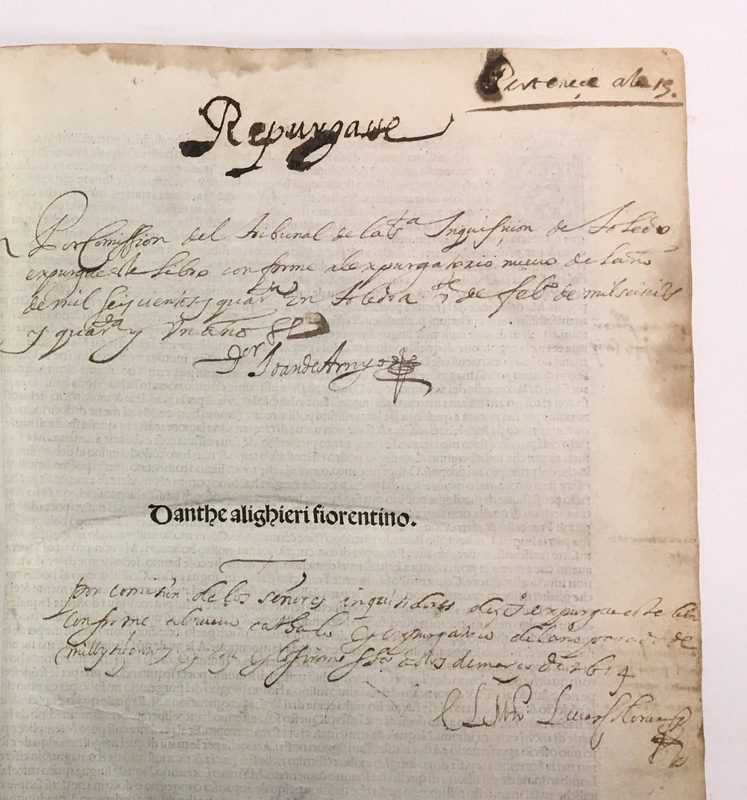 On the title page of our copy, it bears two signed manuscript annotations dated from 1614 confirming that the book was reviewed by the Expurgation Commission at Toledo (as an aside, if anyone can transcribe the signatures, drop us a line). At various points throughout the book, you can see where the offending passages were redacted with ink leaving the rest of the book intact for readers. A number of pages also have marginal notes likely made by the members of the committee who reviewed this title. 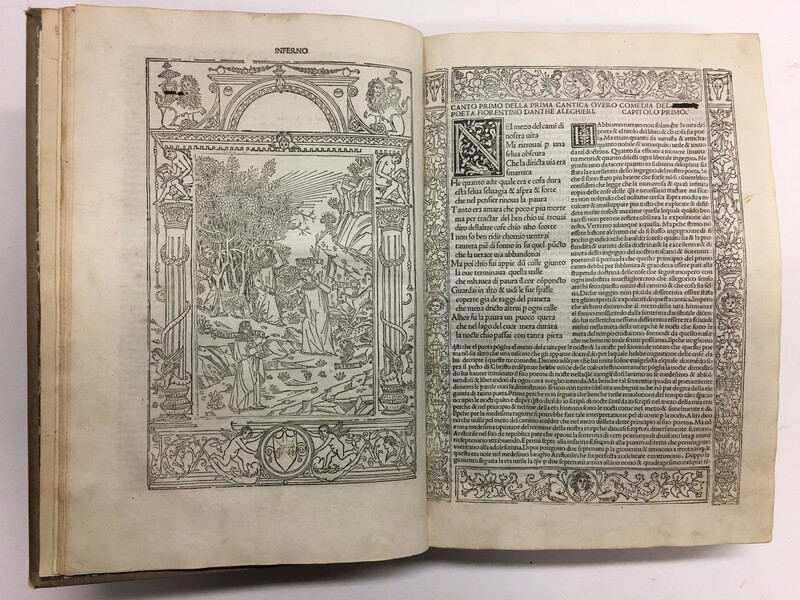 For the most part, it was Christoforo Landino’s critical commentary surrounding the poem that the Inquisitors took issue with rather than Dante’s work itself. Redacted passages with marginal annotations. Single line with marginal annotation. If you look very closely, someone has added devil horns to the figure in the top right corner. The likelihood that this type of book censorship actually prevented readers from accessing controversial content in Spain is debatable and did very little to hinder the spread of intellectual ideas there.3 And in our copy, some industrious reader has washed away the ink that covered a redacted section, exemplifying the idea that restricting certain information only increases its appeal. Large sections of the commentary by Landino were redacted. 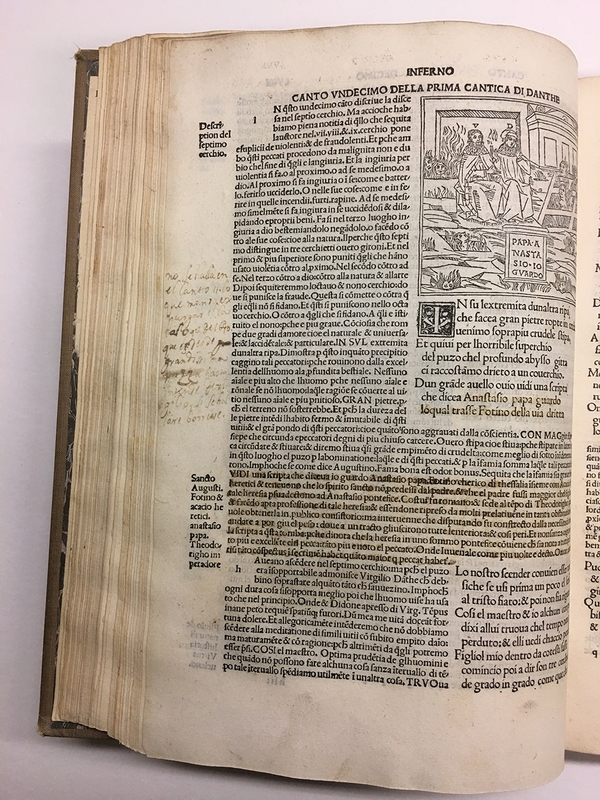 Some past reader has attempted to remove the ink to view the text beneath it. 1. Parker, Deborah. Commentary and Ideology: Dante in the Renaissance. Duke University Press, 1993. 2. Bald, Margaret, and Ken Wachsberger. 2006. Literature suppressed on religious grounds. New York: Facts On File.